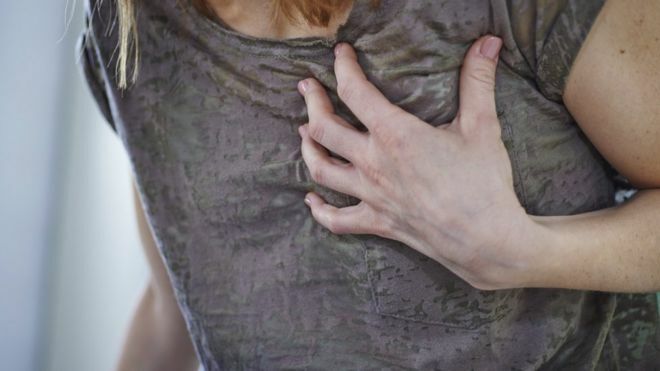 UK researchers say they have found a new way to tell if a heart attack is more severe and might cause lasting harm – by looking for bruising or bleeding in the heart muscle. Patients with this sign on scans more often develop serious problems like heart failure, says the Glasgow team. It’s hoped the discovery could help with preventing such complications. Half a million UK people have heart failure and heart attacks are the leading cause. Heart failure can leave people unable to do simple everyday tasks, such as climbing the stairs. Symptoms occur because the damaged heart doesn’t have enough strength to pump blood around the body efficiently. This makes the person breathless, tired and, untreated, means fluid can gather in the legs and lungs. There are drugs that can help, but these have to be taken long-term. Some people with heart failure may need heart surgery too. The British Heart Foundation-funded work followed just over 200 patients to see how well they fared in the hours, weeks and months after being rushed to hospital with a heart attack. The researchers, who are presenting their work at a heart conference in Manchester, ran extra tests on the patients while they were in hospital. Prof Colin Berry and his team found that patients who had signs of bleeding in their heart muscle were more likely to develop later complications than patients who didn’t have this damage. This type of knowledge could ultimately help when doctors are deciding what treatment they should give and how long the patient should be closely monitored, says Prof Berry. He suspects the bleeds may partly be caused by the blood-thinning drugs that doctors need to give to patients to treat a heart attack. Heart attacks occur when the main blood vessels supplying the heart get blocked by a clot. Prof Berry says the tiny blood vessels in the heart muscle tissue itself can also get blocked, and this makes them leaky. He says nearly half of heart attack patients probably have some bleeding or bruising of the heart – although not all of them will develop heart failure. “This might explain why patients who have had effective treatment for their heart attack can still have adverse outcomes. “We now know heart muscle bleeding is an adverse complication that we want to avoid,” he said. His team is now investigating whether there might be a better way to treat patients who have had a more severe heart attack – by injecting blood-thinning or clot-busting drugs directly into the heart’s blood vessels rather than intravenously, for example. It is important to seek urgent medical help if you think you or someone you know is having a heart attack because prompt treatment saves lives.